The events that transpired at the First Baptist Sutherland Springs church in Texas left the nation shocked. Since the dawn of time, churches and temples have been a place of refuge and a common gathering place where members of the community could come together and form relationships. That’s why it’s so saddening and disheartening to see churches being targeted today by individuals and terrorist groups wishing to do harm. This has caused many churches today to take a second look at security. Safety has now become an even bigger priority for churches. Many church board groups have begun to look beyond traditional safety measures into more advanced methods, such as ballistic resistant window film. Ballistic resistant window film provides Salt Lake City churches and temples with a way to protect their congregation from terrorist attacks, shootings, and dangerous situations and keep their house of worship safe. While the events that happened in Texas were indeed tragic and severe, they were not something completely unfamiliar. Churches have been targeted in the past by shooters and terrorists and during many of these incidents, innocent lives were lost. Today, many churches recognize the need for security, but how to obtain it remains another matter. Criminals often gain access to a building by shooting or smashing glass panes in doors and windows. Bulletproof glass and bulletproof window film are viable options for preventing forced entry, but they are expensive investments to make. And unfortunately, many churches do not have access to the necessary funds. Ballistic resistant window films provide a cost-friendly alternative to bulletproof glass that Salt Lake City churches can use to protect their property and community. Revolutionary for their time, ballistic resistant window films use the power of nano-technology to reconfigure the material makeup of glass so that it is stronger and less fragile. Field tests have proven that when ballistic resistant window film systems are in place, glass can sometimes resist multiple gunshots. Instead of breaking immediately, windows are able to resist impact for some time. For churches, this can provide precious time for families to get to safety during emergencies. And at other times, it can provide peace of mind and comfort. 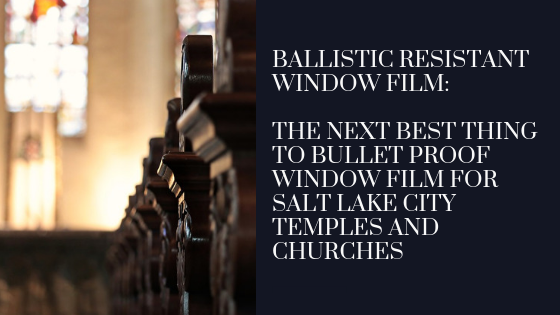 If you’re interested in learning more about the benefits of ballistic resistant window film for your Salt Lake City church, we would be happy to chat with you. Contact us today to get in touch with a member of our team or receive an estimate for your project.